Most orders are processed and shipped next business day from our headquarters in San Diego, California. Order processing time varies based on product availability and production requirements (e.g. name/number customization). In-stock items not requiring customization ship within 3 business days. For product requiring customization, please refer to the product page for estimated processing time. Shipping rates are calculated based on estimated package weight and shipping destination. Flat-rate shipping is available for qualifying orders. 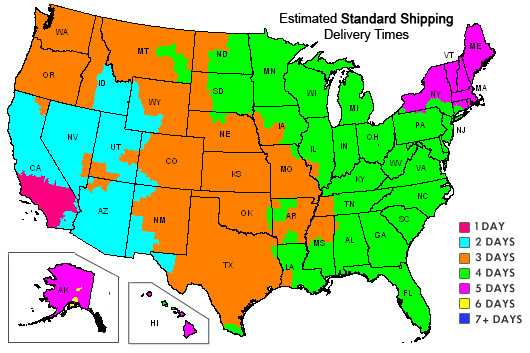 The map to the right shows estimated Standard Shipping delivery times from our headquarters in San Diego, CA. Free in-store pickup is available at each soccerloco retail locations in southern California. When using in-store pickup, you will receive a call from the selected store when your order has arrived and is ready for pickup. If an item is backordered, the ETA will be noted on the product page and on your order confirmation. You may receive periodic emails updating you on the status of your backordered product. Please allow up to 4 weeks for processing of Team Room orders. Processing time for a Team Room order depends on product availability, production requirements, and seasonal changes is fulfillment velocity.